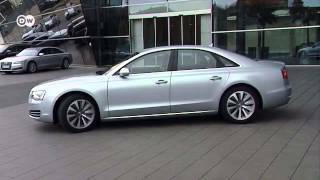 For the year 2012, the Audi luxury saloon gets a double drive that has the power of 245 horses and consumes less than 6.4 liters per 100 km (37mpg). 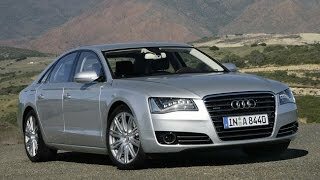 The Audi A8 Hybrid 2012 can complete the sprint in 7.7 seconds and has a top speed of 235 km/h. 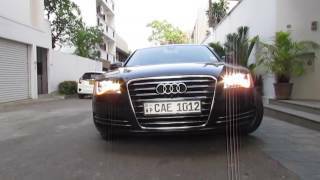 Using only electric power, the A8 hybrid can cover upto 3 kms at a constant 60km/h speed. The car can be driven in three modes: the TDI, pure electric or hybrid mode. The Audi flagship is designed as a highly efficient parallel hybrid.The 2.0 TFSI, modified in some areas, brings it to 155 kW (211 hp) and 350 Nm of torque, which abuts 1/min 1500-4200.The internal combustion engine works with a disc-shaped electric motor that provides 40 kW (54 hp) and delivers 210 Nm. The permanent-magnet synchronous machine, occupies the space of the torque converter before the modified eight-speed tiptronic.A multi-plate clutch running in oil bath, connects or disconnects the electric motor and the TFSI.The clutch works in every situation highly precise and gentle.The comfortable and fast-switching hybrid transmission transfers the torque to the front wheels, with its large ratio spread it contributes to the efficiency of the Audi A8 in hybrid. The short-term performance of 180 kW (245 hp) and 480 Nm of torque ensure system is very agile.The Audi A8 hybrid sprint in 7.7 seconds from zero to 100 km / h and further to 235 km / h.Its consumption in the EU cycle is less than 6.4 liters per 100 km, CO2 emissions remain below 148 grams per km (all figures are provisional). The Audi A8 hybrid can travel up to 100 km / h speed electric power alone, at a constant 60 km / h it achieved up to three kilometers of range.The driver can choose between three programs.The characteristic field EV concedes priority to the electric drive, the program controls both D motors efficiently.S mode and the tip of the tiptronic gate are designed for a sporty driving style.The hybrid sedan has five operating states: you can only drive the TDI, pure electric or hybrid mode, it can also boost and recuperate.Two ads for the driver to visualize all the operating states in detail. The lithium-ion battery, which weighs 36.7 kg, sits in a crash-safe area of ​​the luggage compartment.It provides 1.3 kWh nominal energy and delivers up to 40 kW.Depending on your needs it is cooled by air in two ways - by a fan from the interior and its own cooling circuit, coupled to the automatic climate control.It remains at that temperature over large areas of window in which they can realize their full potential.The electric motor and a compact power electronics that is between him and the battery, as regulator, can be cooled with water. Visually, the Audi A8 hybrid is to recognize subtle details.The ten-spoke alloy wheels of his - with 18 standard, with optional 19-inch diameter - are reminiscent of turbine blades.Hybrid logos adorn the body, as an exclusive Arctic Silver paint to choose from.The metallic finish, a three-zone climate control, LED headlights and a Bose sound system are standard. The Audi A8 will be one of the lightest hybrid sedans in its class - thanks to the ultra-lightweight design expertise of the brand.Its body is formed in the ASF (Audi Space Frame) made of aluminum, the B-pillars are made of hardened form ultra high strength steel.It weighs only 231 kilograms, about 40 percent less than a comparable steel structure.